Jeff Shea on Top of Mount Everest, 1995 Tibet/Nepal, Mount Everest – 35mm film Seven Summits – Mount Everest, World’s Highest Mountain Summit of Mount Everest, 29,028 feet (8850 meters), taken with my camera by Lhakpa Gelu. Tsering Dorje, known as Lama, behind. After having sailed across the ocean and traveled many miles by land, I reached the ridge above Namche Bazaar in the Solo Khumbu of Nepal and spied the windblown cap of Mount Everest for the first time in my life. During the weeks that followed, I had vague aspirations about climbing the mountain, but they seemed like pipe dreams. My first grapplings with Himalayan altitude, as I panted up a 6000m peak for the first time a few weeks later, emphasized Everest’s unattainableness. The Himalayan magnificence was upon me, more impressive than I could have imagined, the sheer size dwarfing any other mountain range in the world many times over. 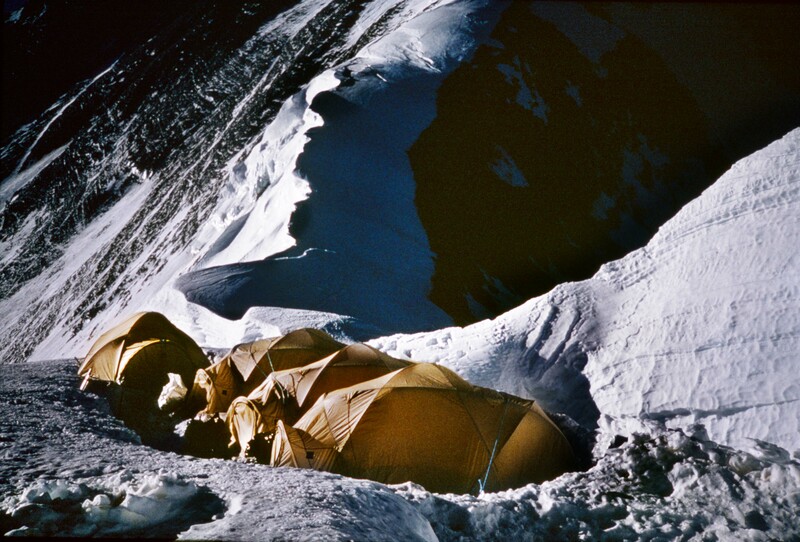 On that journey in 1983, I stood at Kala Patar and surveyed the grand array of icy peaks; I huddled in the warm emptiness of a mess tent at the South Col Base camp at 5200m, in awe of those men and women that were actually on an Everest expedition. I breathed in the Tibetan Culture at Thyangboche monastery during Mani Rimdu, delighted, marveling over the color and richness of the costumes of the masked dancers. Unable to sleep, and lured by the moonlight, I stepped into the crisp December night, and scrambled up the rocks until I was far above Thyangboche. In the unimaginably vast canyon formed by Ama Dablam and the Everest massif, the perfect silence was suddenly broken by the echoing trumpet of the ancient horns of the monastery, dispelling evil spirits and resounding with the purity of good intent. Magic! I came away from my first Himalayan trip feeling it was not surprising that local animists attributed god-like powers to the mountains. Indeed, they seemed to have a spirit of their own. Twelve years later, I found myself lured again by the Himalayas. Except this time, I was not a trekker, but a climber. On the journey from Lhasa – at the top of the astonishing monastical ruins of Xegar – Cho Oyu, Shisha Pangma, and Makalu appeared amidst the clouds. 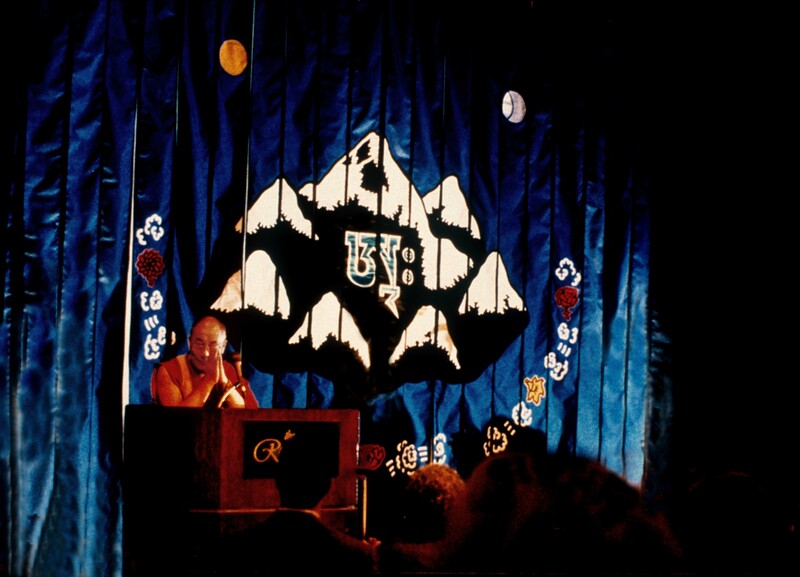 While there, a Xegarian monk portended, “You see Everest, good luck. You no see Everest. No good luck.” Just as we gathered to leave,the clouds cleared to reveal Everest in all its glory, towering above the rest of the landscape. The Base Camp itself affords one of the best views in the world, a sweeping view of Changtse, the North Ridge, the Great Couloir, the West Ridge, the North Face, and the summit pyramid, with the jet stream sailing off it in a vaporous plume. The Rongbuk glacier spills out at the head of a broad, flat plain. 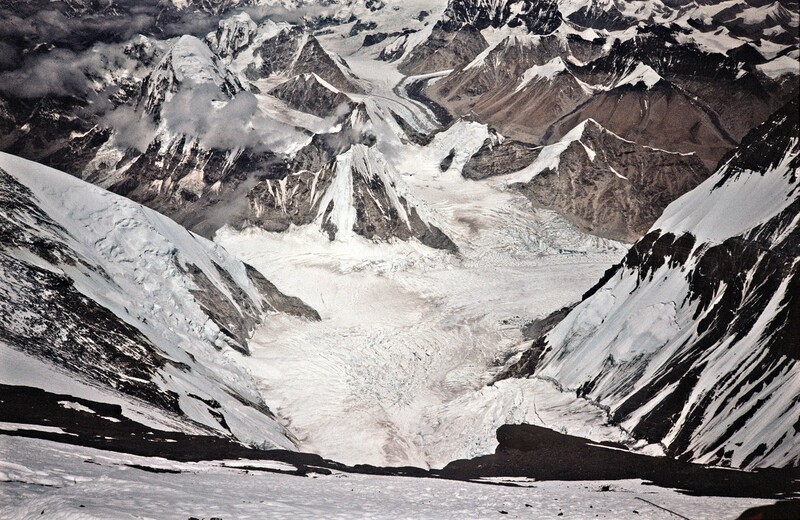 The route winds clockwise around Changtse, through the ice pinnacles of the East Rongbuk Glacier. Twenty-one kilometers of trail ends at Advanced Base Camp (ABC) in full view of the North Col and the summit pyramid. Resisting the trend to rush headlong to ABC, I followed the advice of Australian Jon Muir, who reckoned that the best way to acclimatize was to simply hang out at Base Camp. For 12 days I did so. I arrived at ABC on April 25th, 1995. Two days later, I traversed the glacier to the foot of the precipitous slope leading to the North Col, a picturesque mass of tumbling house-size blocks of ice which must be negotiated to reach the Col itself. Light avalanches rumbled off to my left from the flanks of the North East Ridge. A seldom-discussed Everest disaster occurred in June 1922, on the second-ever expedition to Mount Everest, when the slope I was about to climb avalanched, taking the lives of seven porters. In all, avalanche on the slopes leading to the North Col have killed at least 16 people, nearly as many as the far more notorious Khumbu Icefall. My acclimatization schedule sent me to the Col four times. Although in some places it was steep enough to make an unroped fall fatal, the snow was soft and felt secure. Wending my way around the blocks of ice brought me to the Col at 7050m, affording a clear view of the North Face, its enormous Great Couloir ending in an ice cliff of unimaginable dimensions. The summit seemed as if you could reach out and touch it. The tents were nestled on the leeward side of an ice buttress, sheltered from the 70 knot winds that scoured the North Face. On April 30th, I climbed to Camp 2 at 7600m. From the North Col, the route continues on a wide, gradually steepening saddle of snow. At first, I was comfortable as the sun was out and the wind was just a breeze. Almost imperceptibly, the conditions deteriorated. Visibility shrank to a few meters and the chill crept through heavily insulated boots. The dwindling of my inner core’s heat became a concern. I had been using the fixed ropes to safeguard a fall, only to discover that the top snow stake holding them slid easily out of the ice. At the top of the snow saddle, I arrived at a pair of tents flapping violently in the wind. Climbing partner Fred Zalokar and I feebly made unappetizing soup, and then scooped our spilled water from the tent floor. I slept restlessly, constantly aware that the wind was blowing like crazy. I wondered what might happen if the tent ripped apart. The wind continued unabated through the night. The next morning, Fred and I took seemingly forever to get ready to descend. Thoughts of putting our boots on occasionally rousted us from our altitude-induced stupor long enough for us to look up from our sleeping bags; then we would slide back into a senseless haze. It took me 11 days at lower altitudes to recover, most of it spent 13 miles below ABC at Base Camp. By this time, the rescues had begun. There were plenty of them, though it seemed not all of them should have been necessary. One climber purposefully stopped below the Second Step at 8500m in order to make supposed history by recording the highest bivouac ever. The irony was—beyond the obvious lunacy of the goal itself—that, after draining the resources of other teams and coming close to losing his life, he apparently had not been aware that Doug Scott and Dougal Haston had successfully bivouacked on the South Summit at 28,750’ after a first ascent of the South West face in 1975. 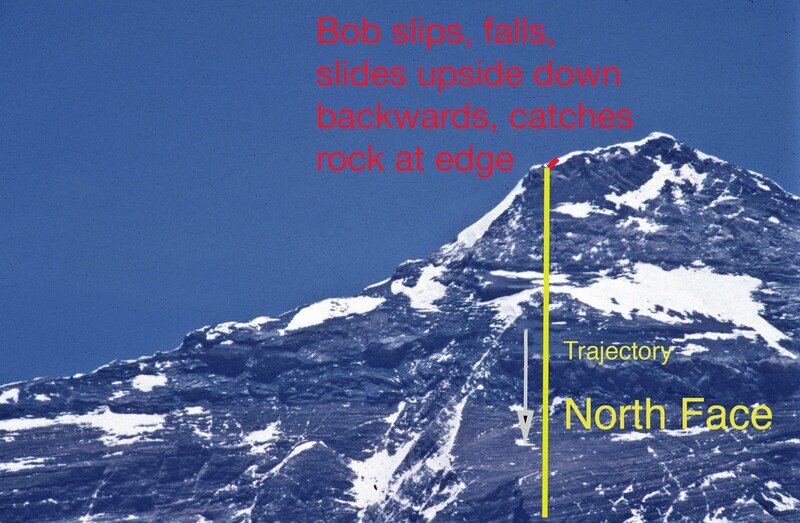 Our team leader, Jon Tinker, being asked to loan three Sherpas to evacuate another climber with a blood clot in his leg, noted that such a maneuver required twelve able-bodied people. Russell Brice, leading an adjacent team, said that a year earlier a five-hour evacuation from ABC had required twenty-two to assist. Instead they settled on the plan to hire nine yak herders to carry the climber down. In another occurrence we watched with trepidation through binoculars from ABC as a climber sat in the summit ridge snowfield for over an hour, motionless. In all, not one climber was lost on the North Ridge in 1995. On May 12th, I was back at Camp 2. I felt stronger, the minor miracle of one month’s acclimatization. Above Camp 2, the route ascends through a patchwork of rock and packed snow. (Whereas in the Fall, the whole mountain is blanketed in fresh monsoon snows, in the Spring, the route above Camp 2 is windswept—what little loose snow falls soon is lifted off by howling wind.) I climbed alone enjoying the sunny, windy solitude. I could see far into the hills of Tibet, brown and austere. I spent a solid week eating at ABC to regain some of the 14 kg (30 pounds) lost from my 82kg (180 pound) frame. One evening during my respite at ABC, a buoyant Alison Hargreaves popped into our mess tent for a visit. (She appeared as fresh as she did on the flight to Lhasa at the beginning of the expedition when I absurdly mistook her for a non-climbing companion of another climber!) 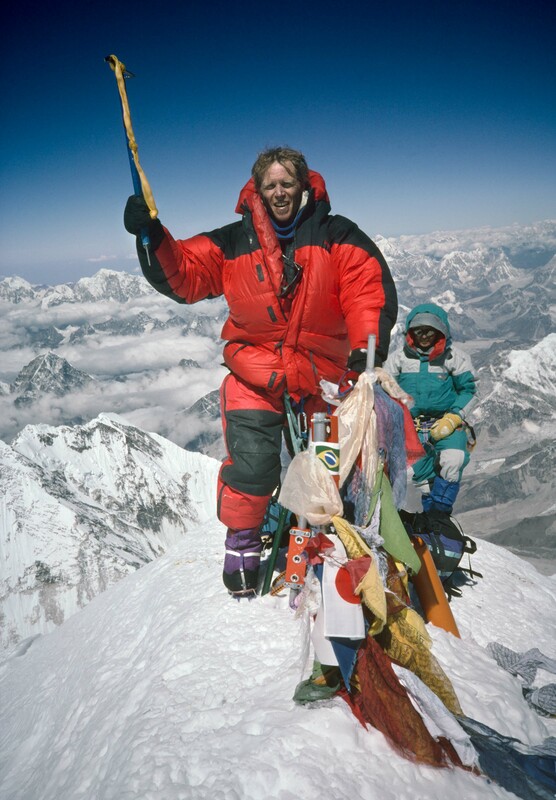 She had just successfully completed an unassisted climb to the top of Mount Everest without oxygen. Her goal was to climb the three highest mountains in the world in one year. Three months later she was dead, having been caught in a storm on her way down from the summit of K-2. When I reached 8000m above a 30° snowfield, I considered my acclimatization completed. It was time to descend and shore up my strength for a summit attempt. On 20 May, I was back at the Col with Yves Detry, Patrick Hache and Andre Tremouliere. The next morning, radio reports informed us that two climbers were blocked by high winds for the third day in a row at Camp 3. Given it was late in the season, I concluded wrongly that this year’s unusually good weather was at an end. We debated the pros and cons of my retreat. When he reminded me of their special stockpile of French cheese, sausage and crackers, my resolve to abandon camp vanished. As if to validate my gastronomical instincts—and Yves’ experienced advice—the winds died down during night, allowing us to move up the saddle the next morning. Arriving at Camp 2, my French companions deemed that the wind, having brewed up again, was advising us against continuing. I ‘leaned into it’ and moved up a few hundred meters to camp with Lhakpa Gelu and Lama Dorje of Nepal. The following morning, in fine weather, Lhakpa, Lama and I, passing the 8000m snowfield, ascended a gully of snow, arriving at Camp 3 by early afternoon. The sloping high camp lay at the rocky base of the Yellow Band, a place where finding protection from the wind was extremely difficult. It is rumored that in 1952, when the North Side was off-limits to Westerners, six accomplished Russian climbers were literally blown off the face of the mountain from the Camp 3 area. We took a meal in the late afternoon and bedded down while the sun was still shining. After six weeks of restless sleeping, I now used supplemental oxygen for the first time. My frigid fingers and toes felt a sudden rush of warmth, and I slipped away to dream-filled and euphoric slumber. At 10pm I awoke, my lungs pulling vainly for air on an empty bottle. We drank tea and checked our gear, departing just after midnight. It was pitch black. Our vision was confined to the narrow beams of our headlamps. We moved straight up through snow and rock gullies, seemingly for hours. I longed for an end to the incessant upward effort. We then began traversing down and to the right, signaling that we had arrived at the North East Ridge itself. The air was remarkably still. Horizontally traversing an exposed patch of snow to a fixed line, we jumared up and around the First Step. Approaching the fabled Second Step, we ascended downward-sloping terraces of crampon-scratched shale only a boot-wide. I used my ax in “piolet canne” (like a walking stick) to balance on my crampon points. Perhaps fortunately, the moonless darkness rendered the drop-off invisible (while, notably, the reverse was true on descent). Seventy-one years earlier, in 1924, Mallory (who boldly attempted Everest ‘Because it is there’) and Irving were last seen alive in this area. The shelves of shale supported old, loose ropes, dubiously secured by pitons, in some cases no more than flat rusting iron anchors placed into cracks of eroding, stratified rock. The ropes’ false security was worrying. However, a week later, another climber, while coughing up bowls-full of lung matter on descent, was held by them when he slipped. At about 4am we scrambled up rocks to the foot of the Second Step, a high, ungainly outcropping of rock at 8600m. Visible from base camp, this was the crux of the North Ridge route. In 1975, the Chinese left a relic of the first undisputed North Ridge ascent: the “Chinese Ladder.” Lhakpa stepped onto it and climbed to the top rung. Then, wrapping his forearm around a half-dozen fraying ropes that dangled from above, he hoisted himself up and out of view. As I came over the edge of the Second Step, I was transfixed by the awesome view in the dwindling twilight. The North East Ridge was bathed in the golden light of dawn and the summit pyramid looked remarkably close. (See the song Words for an excerpt from this passage. At 8750m, a final snowfield separated us from a platform from where, I had been told, the summit was an “easy walk.” Near its top, Lama disappeared to the right among the rocks. I followed Lhakpa up to the left, remaining on the snow unroped. My ice ax flew back at me, having hit solid ice just under the surface. I glanced back and was a bit shaken by the meaning of the commitment I had made. If I fell, could I self-arrest? More likely I would hurtle uncontrollably down the North Face. It being an exceptionally fine day and only about 8am, I afforded myself the luxury of chopping steps for security. After laboring for half an hour, I came to a frayed remnant of rope. Lhakpa peered over the platform and motioned to me that it would hold. I clipped in and climbed the remaining 20m to the platform. During 40 minutes of celebration and photography, I reminded myself that the day was not done. At least 15 people had died descending Everest after summiting. During the eight-and-a-half-hour descent, I suffered extreme dehydration, which was made worse by the effects of the dry ambient air and bottled oxygen. When I tried to swallow, I gagged, then flew into a fit of dry retching. Later, the condition grew serious. I reached inside my mouth and extracted a strange brownish gel that had formed over my teeth and gums: I discovered later that some of the enamel of my teeth had flaked off. The mixing bag of my oxygen mask became a deflated sack of ice. About 100m above Camp 3, I ground to a halt, my oxygen having run out completely. At about 6pm, I laid outside the tents, stretched to my limit, reveling silently that I had made it. I spent the night without dinner, then headed to the North Col the following day. After our expedition, at an American Himalayan Foundation event, Bob Hempstead and I found ourselves sharing an elevator with another Everest summiteer. We were shaking hands with Sir Edmund Hillary! Bob blurted out, “We summited Everest.” I naively added, “From the North Ridge!” A man of impressive stature, Sir Edmund smiled down on us, as if beaming approval on the progeny of his pioneering. But I sensed his mind was far away. Perhaps he was thinking of the speech he would give that evening, which covered his climbing career and his school-building program in the Solo Khumbu. Somehow I sensed that long ago, he had recognized that reaching the summit of Everest was secondary to the effort of helping those people who had helped us to get there in the first place. The thrill of reaching the top of Everest is equaled by the privilege of having been to Tibet, and I will never forget its landscapes and its native people. 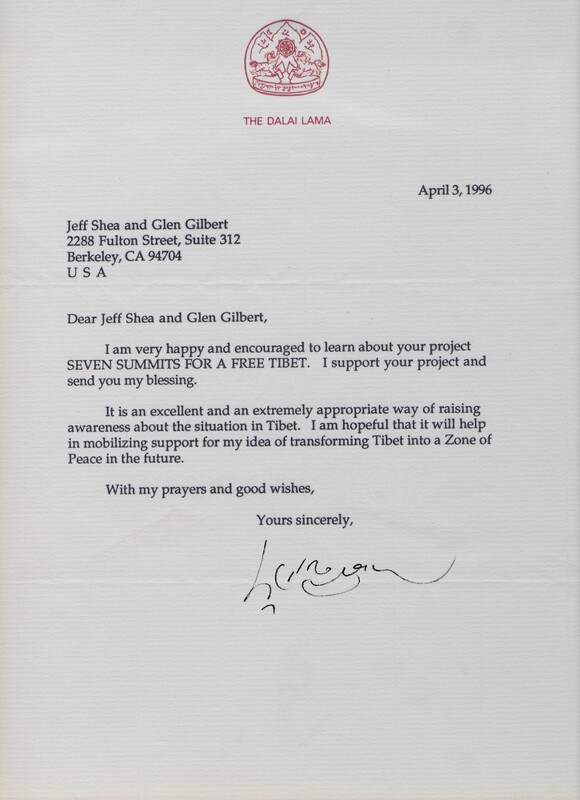 Later that year, I dedicated my Seven Summits adventure to the Dalai Lama’s dream of Tibet as a World Park, a wildlife refuge and non-nuclear Zone of Peace.